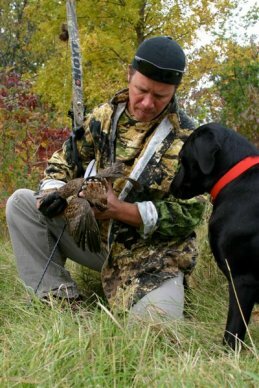 For years I wondered which were the best bird points for bird hunting with a bow. I tried field points, judo tips and some of the other popular tips. I wasn’t hunting turkeys, I was actually hunting upland game birds such as ruffed grouse, quail and pheasant and even migratory game birds with my bow and arrow, shooting them on the wing in front of my pointing dog Brooks. I have hunted all of these with a shotgun since I was twelve years old, and finally came to the conclusion that it was time for me to really start challenging myself and improve my archery skills at the same time. As mentioned I tried a lot of bird points shooting at wild birds on the wing, but as an archer I am not above taking a game bird on the ground at 18 yards with my recurve either. With my desire being to shoot them out of the air I had to find a bird point that performed as well on birds on the wing as they did on birds on the ground. With arrows costing as much as they do I soon realized that the Snaro from Snaro.net was my best option as they delivered lethal hits on birds (and other targets of opportunity) and even on a miss the arrows were easily retrievable. If you ask me about the best bird points the Snaro will be at the top of my list. Lost arrows are almost nonexistent and hits are devastating on birds and other smal game species such as squirrel and rabbits. Yes, a Snaro is heavy. That’s a good thing folks! Think about how far your average shot on small game is going to be….12-15 yards? Ask your buddies on Archerytalk or Tradgang to do the math and figure out your kinetic energy delivered to target with your bow at that range. While your on your computer waiting for that answer I’m gonna be out smashing some more birds with my Snaro!